PV Sindhu has had silver medal finishes at the Olympics, at the World Championships but she would hope to go one better at the season-ending Dubai World Super Series Finals. She has become the second Indian to reach the summit clash and has a strong chance to go one better when she takes on Japan’s 20-year-old Akane Yamaguchi. Sindhu had easily swept aside Yamaguchi in the round robin stages where she had won 21-9, 21-13. Sindhu enters the final on the back of a straight sets victory over Chen Yufei while Yamaguchi beat Thailand’s Ratchanok Intanon. Catch live scores and updates from PV Sindhu vs Akane Yamaguchi in the final. 1640 hrs IST: Third game and Sindhu once again has taken a 3-0 lead in the game. Can she continue her dominating game and become first Indian to win a gold medal at Dubai Finals? 1635 hrs IST: Yamaguchi wins the second game 21-12 and levels it 1-1 in the three-game match. Sindhu looks a lot tired after the mid-game break of second game! 1628 hrs IST: Yamaguchi has just run away with this game. Sindhu is struggling with her game now. Sindhu looks tired and fatagied ! 1624 hrs IST: Not the best way for Sindhu to end the first half of the second game. A service into net and Yamaguchi leads 11-9 at the mid-game break! 1620 hrs IST: Yamaguchi has been fantastic after Sindhu took a 5-0 lead in the second game. The score is level at 8-8 in second game as Yamaguchi makes her way back with some good smashes! 16:10 hrs IST: Sindhu starts the second with two straight points. The early lead is crucial as she will look to end this match in two games only! 16:07 hrs IST: PV Sindhu wins the opening game 21-15! She took seven straight points to make it 20-13 before Yamaguchi took two points. A cross-court drop shot to finish the game in 23 minutes! 16:03 hrs IST: Four point lead for Sindhu! She moves on to 17-13 with a stinging smash down the line. Full use of her height there. Brilliant game. And again! That is murderous from Sindhu! 1554 hrs IST: Sindhu with the lead at the break in the first game. She looked tired at the start but takes six straight points and the lead against Yamaguchi! 1551 hrs IST: Sindhu controls the latest rally and another comeback from the Indian. She makes it 8-8 in the opening game. Both players are looking at the top of their game! 1547 hrs IST: Nice recovery from Sindhu! She has drawn level with Yamaguchi 5-5. The latest point is a cross-court smash away from Yamaguchi. Brilliant point for Sindhu! 1545 hrs IST: Despite a confident start and taking the first two points, Yamaguchi snatches the Olympic silver medallist’s lead and makes it 4-2 in her favor. 1520 hrs IST: PV Sindhu takes the court against Japanese Akane Yamaguchi in hope to create history and clinches maiden gold. 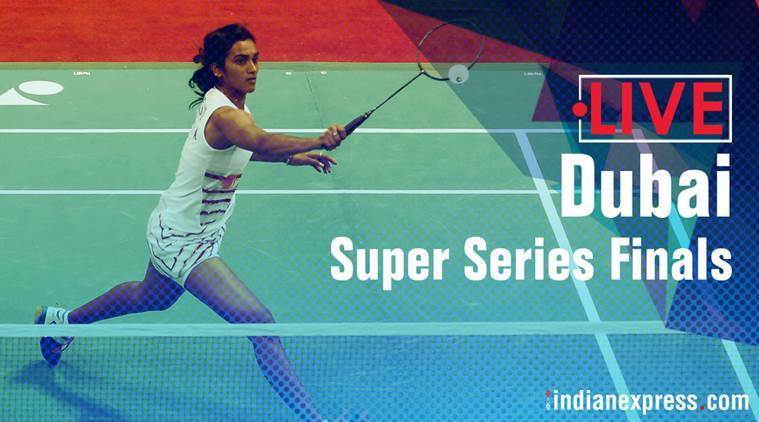 1450 hrs IST: Hello and Good afternoon for our live coverage on what could be a historic day for Indian badminton. PV Sindhu has already taken Indian badminton to new heights with her Olympic silver medal back in Rio in 2016. She would now hope to become the first Indian to win the year-ending World Super Series Finals. In her path stands Akane Yamaguchi of Japan. Sindhu recently beat her in the group stages and overall stands at a 5-2 advantage on a head-to-head basis. They’ve met twice more this year with both winning once each. Next articleGujarat and Himachal Pradesh Election Results Tomorrow, Will BJP Prove Exit Polls Right?